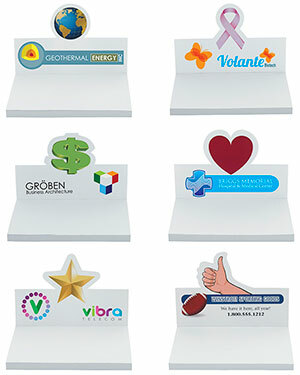 Add impact to your imprint with shapes! 4-Color process (4CP): Price includes a free 4-color process imprint on holder cover (front and back). Add $.12 per pad for a 4-color process notepad imprint. Full bleeds available. When ordering between quantity breaks, orders must be placed in 500-piece increments.Custom die-cut shapes are available for a $550(Z) die charge. 5 working days. Add 2 additional days for imprinted notepads. Custom die-cut shapes will be shipped within 15 working days of receipt of proof approval.